As an optometrist and a shooter, I realize the importance of good vision to shooting well. I’ve hosted a website on prescription shooting glasses for over 20 years, and the most common question I get is from handgun shooters who can no longer focus clearly on the front sight of their handgun. At the same time, they usually complain about having difficulty reading. These complaints always come from people over 40 years of age. The problem is so bad for some shooters, it causes them to give up on shooting handguns. So why does this happen, and what can we do to help these folks? As we age, the crystalline lens in our eye loses its elasticity. The medical term for this is presbyopia. In the early stages, it’s not a serious problem and we can deal with it by holding reading material further away and increasing ambient light. But this only works for so long. These folks then purchase over-the-counter reading glasses, and this helps them read. When these glasses no longer suffice, they break down and make an appointment to see an optometrist. The optometrist will probably give them a clean bill of health and prescribe proper reading glasses or some form of a progressive lens, if required. Unfortunately, reading glasses or progressive addition lenses (PALs) will not clear the front sight for handgun shooters. While PALs work great for everyday tasks, there is too much distortion in the peripheral area of these lenses and this creates more problems than it solves for handgun shooters. Single vision readers will be too strong and blur the target too much. Serious handgun shooters require clear, intermediate vision to see their front sight. The target can be blurred slightly, but the front sight must be perfectly clear. 3. Information regarding left or right-hand shooting With this information, it is possible to prescribe a lens for your shooting eye that keeps the front sight clear and sharp. In the other eye, an optometrist would use a single vision distance correction, with or without a conventional lined bifocal. With the front sight of your handgun clear, it’s time to discuss frames for shooting glasses. 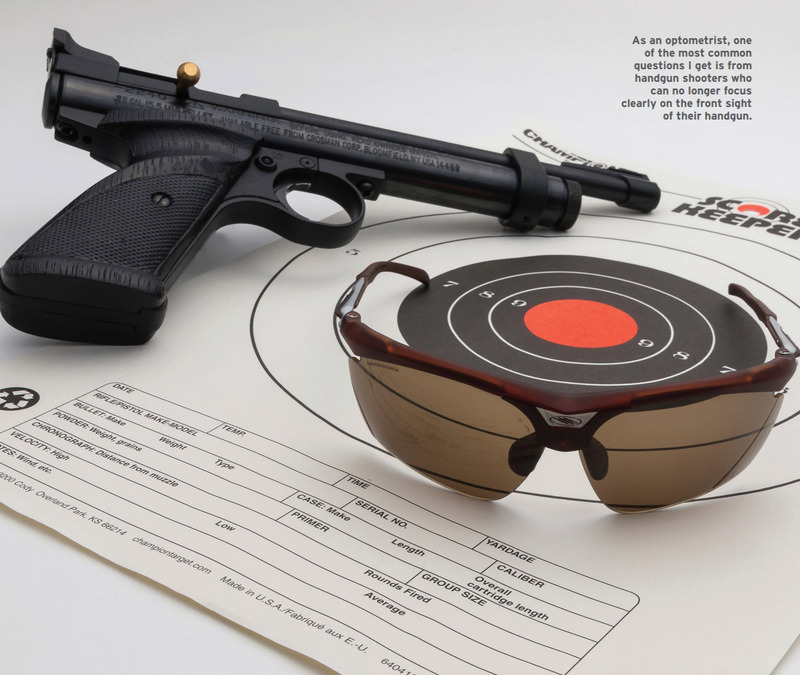 Our most popular frame for handgun shooting is the Rudy Project Rydon Shooting and Performance Kit. These frames are available with five tinted lenses. 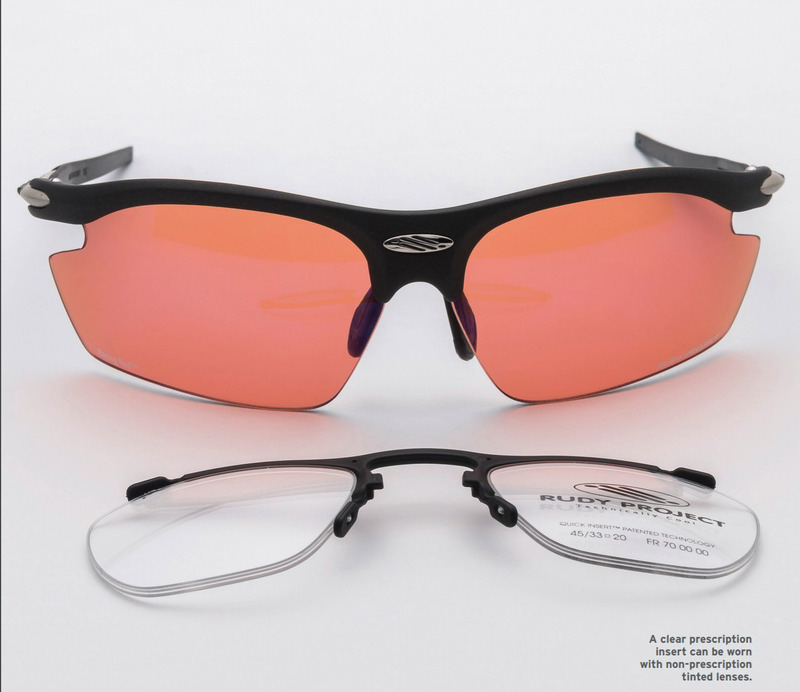 The prescription can be ground into each of the tinted lenses or a prescription insert is available with five different plano (non-prescription) interchangeable lenses. They also make the Magster Performance Shooting Kit. The Magster comes with one pair of lenses. The prescription can be ground into the lens in the tint of your choice, or a clear prescription insert is available with a plano tint of your choice. Tint preference is a personal thing, but it’s also dependent on ambient light conditions. These frames fit differently, and I recommend you try them on to determine which one is right for you. Lens material is important in shooting glasses. Glass lenses are now obsolete, as normal spectacles use CR39 (plastic resin material). But shooting lenses are made from polycarbonate material, because the polycarbonate provides the greatest safety margin. All clear lenses used for shooting should have an anti-reflection (AR) coating. These coatings increase light transmission from 92 per cent to 99 per cent. Quality AR coatings are expensive, but worth every cent. These coatings are applied to riflescopes and binoculars for good reason. Visual acuity is improved and internal reflections and ghost images are reduced. Lenses should also be coated to resist scratching. We dispense a fair number of shooting glasses for law enforcement personnel. These officers are required to qualify regularly with their handguns, but also need a prescription lens for daily wear. We can use a separate prescription lens for practice, compared to what they need to wear on duty. The Rudy Project frames are perfect for this application, as the lenses and lens inserts are interchangeable. Contact lenses For patients wearing contact lenses, there is another option to clear the front sight of your handgun. These are multi-focal contact lenses. Contact lenses eliminate fogging, misplaced glasses, dealing with precipitation and taking the glasses off and on. Contact lenses are a great option for full or part-time wear, no matter what your visual correction is. They are available as a one-day or one-month frequent replacement basis. These lenses are very comfortable and will clear the front sight of your handgun. The technology has come a long way, and for contact lens wearers they deserve a look. There is another way to help clear the front sight of your handgun using the normal chromatic aberration in your eye. From high school physics, we know that when white light is passed through a prism it is broken into the colours of the rainbow. The longer wavelength of red is focused further away from the prism and the shorter green wavelength is focused closer to the prism. When monochromatic (one wave length) red light passes through a prism it is focused further away than the shorter green wavelength. Our eye is like a prism, and we can use this phenomenon to our benefit. Because green light is focused closer to the prism, in this case the retina, it is clearer than the red light from a red-coloured front sight. If we use a green-coloured front sight insert, such as those made by Hi Viz or Truglo, it will be clearer than a redcoloured front sight. These are interchangeable and are made to fit most popular handguns. Properly designed and fitted ophthalmic-quality eyewear is necessary for presbyopic handgun shooters to perform their best. An accurate refraction and eye health assessment are the first steps. Small amounts of nearsightedness, farsightedness and astigmatism are significant and require correction. A measurement from your eye to the front sight of your handgun is critical. Physical protection provided by polycarbonate lenses prevents serious eye injuries. Multifocal contact lenses and Hi Viz or Truglo front sight inserts are options. 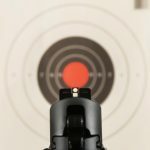 Law enforcement, IPSC and cowboy action shooters over the age of 40 will benefit recreationally and post higher scores in competition from properly designed and fitted shooting glasses.